The seventh installment in one of the most popular economy simulation strategy game series invariably developed by Blue Byte Software since 1993. The latest entry in the franchise combines well-proven gameplay mechanics with a number of completely new solutions. The Settlers 7: Paths to a Kingdom is a real time strategy game that focuses on economy. Your objective is to direct your people so that your kingdom became a land flowing with milk and honey. This title goes back to the roots of the series, however, a proper measure of attention was given to make the game appealing not only to the veterans of the series. The Settlers 7 offers large freedom in choosing a path of development of your empire. You can focus on military, trade, or new technologies. However, successes on these fronts are simply results of healthy economy. Only wise management of your lands and subjects can get you means to defeat rivals. Combat is entirely automatic, excluding you from any manual intervention in battles. Thus, victory or defeat is determined solely by strength of your army. The victory is dependent on victory points. The conditions you have to meet are various (e.g. invent an advanced technology). In order to win you have to earn a certain number of points and hold them for particular amount of time. Gameplay mechanics are characterized by complexity. To help you manage the game progress more easily, a well-thought UI and a system of roads and building was designed. Everything is just a few clicks away. The game explains how do all elements work and gives hints as to what to do in order to succeed. 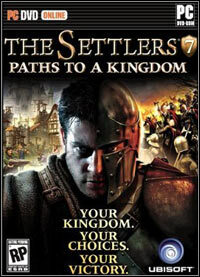 The Settlers 7: Paths to a Kingdom was expanded by multiplayer mode, including both competitive play and cooperation. The Blue Byte game offers players an editor, in which they can create new castles, maps, and add-ons (including new AI-controlled opponents). Besides, the game features Facebook support, chat rooms, online support, and friend list. It is noteworthy that the game requires permanent Internet connection. The game sports neat graphics, generated by a modified Trinigy engine, as well as advanced AI of both player’s subjects and enemies. Game score 8.035 / 10 calculated out of 1333 players' votes. Expectations before the premiere: 8.2 / 10 calculated out of 241 players' votes.